If you have always wanted lighter colored hair but you aren’t quite ready to use any type of dye or chemicals on your hair, then you need to get your hands on some honey so you can naturally lighten your hair. Using dye or other harsh chemicals can damage your high and make it dry. But, honey can actually lighten your hair as well as make it even healthier. In fact, there are lots of women for many years who have used honey on their hair to moisturize it and give it a good thorough cleansing. If you are looking for a completely drastic change with your hair color, then you aren’t going to get it from using honey once or twice. Instead it is more of a gradual change, but that actually can be a good thing because you can really control how light you want to go with your hair. 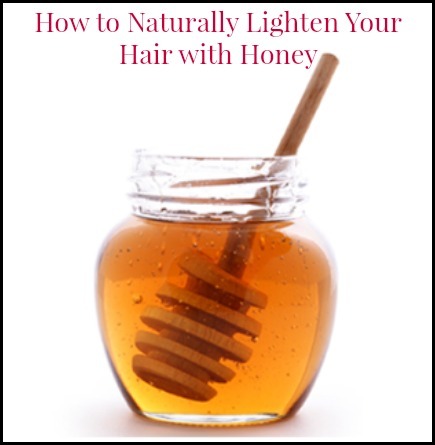 If you are looking to naturally lighten your hair, I would definitely give honey a try. Mix 2 tablespoons of honey with 1 tablespoon of apple cider vinegar. The apple cider vinegar works as a great conditioner on the hair and also helps to thin out the honey so you can apply it to your hair. Add in 1 tablespoon of cinnamon. This will give the mixture a darkest rid appearance, but it will not stain your hair that color. You may have to slightly heat up the honey if you are having problems with it being too thick. Just make sure not to heat it up too much. Mix the ingredients up well and let it sit for at least an hour to develop. Take the mixture and apply it to the areas of your hair that you want to lighten. For people with lighter hair, this may be a good way to extend your color and lighten up any dark roots. Your hair should be dry when you apply the mixture. Use your fingers to massage the honey into your hair especially if you are putting it all over. You will definitely want to place a towel over your shoulders to catch all the drips from the mixture. Once you have it all applied you have a few options you can do with your hair. You can put it up in a bun and wrap a towel around it or you can use a plastic shower cap to protect it and keep it in place. Don’t use a clip or hair rubber band as this may affect the dying process in that area. Leave it on your hair for at least an hour. If you want more dramatic results, you can even sleep with it on your hair. Rinse all the honey mixture out with warm water. Then use your normal shampoo to completely clean your hair from any of the residue. You may need to actually shampoo it twice and then you can just use your normal conditioner as well. You should notice a difference in your hair once it is dry. Caution: Be sure that if you any allergy to cinnamon or honey, they you do not use this to lighten your hair. Any food item that you put on your skin will cause an allergic reaction just like if you ingested it. Using honey to naturally lighten your hair at home can be a great way to save some money and keep harsh chemicals off your hair. You will love the way your hair not only looks but also feels after using this honey mixture.